ABC3’s Studio 3 is proving to be a fertile training ground for its young presenters, where they learn the kind of skills that will see them advance to other shows. Studio 3 airs on ABC every morning from 6-8 am and afternoons from 5-7 pm. In between programming aimed at 8 – 14 year olds, Studio 3 hosts provide the links. Produced at ABC’s Ripponlea studios, the team churns out up to 55 links a week, all ranging from 1 – 3 minutes. With each of those links having to be written, performed and produced, that’s a lot of television and as Series Producer Marie Davies explains, it can only be achieved with a versatile crew, including those behind the cameras. “Most of my team are multi-skilled so they could be floor-producing or lwriting or field producing. I have one senior writer whose main role is to write the breakfast show. But if she’s sick we can step in,” she says. Presenters include channel originals Kayne Tremills and Amberley Lobo, plus James Elmer, Olivia Phyland who usually host in pairs. Other ABC3 faces include Scotty Tweedie, Nicole Singh, Mitch ‘Tommo’ Tomlinson, Joel Phillips, Hannah Wang, Alannah Ahmat and Good Game’s Steven ‘Bajo’ O’Donnell and Stephanie ‘Hex’ Bendixsen. Tremills and Lobo are already hosting additional ABC3 shows such as Bushwacked, My Great Big Adventure, Schools Spectacular and Wacky World Beaters. “The hope is that they will go on to do other ABC3 shows like Kane and Amberley,” says Davies. 23 year old host Phyland joined in December 2011 following an open casting call. She had been studying Psychology and Occupational Therapy but says despite the career detour, it instilled a few skills she has nevertheless been able to call upon. “In Psychology we learned the theory of how to memorise things and at Uni we had to remember masses of information. So I think it helped me be able to learn scripts,” she says. “We’re lucky we get to ad lib a lot but if there are things we have to plug then we need to remember all the shows and what times they are. “I’m really glad I studied. I’m not living in this bubble of ‘I’ve made it as a TV presenter.’ It could fall through. 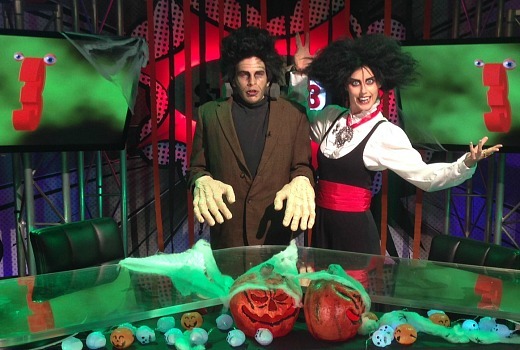 On the day TV Tonight visited, Phyland and Elmer were recording Halloween segments. Donning the spooky garb and throwing in eccentric accents, both were working without an autocue to a rehearsed script. Amongst the more unusual job descriptions are everything from characters to interviews, location work, vox pops, movie launches, competitions and more. “What I love about the job is it’s so different. People ask if I’d like to do acting and absolutely I would love to give it a crack, but I don’t know if it could meet how interesting this job is because you’re constantly forcing yourself to quickly learn new information and it’s so dynamic. But with acting you film the same information, the same few sentences from different angles over and over. So I love how chaotic it is,” Phyland explains. She has also filmed extreme challenges for another series, Live on the Edge. “We went skydiving, shark diving, bungee jumping on a BMX, rally driving –you name it, they made me do it basically,” she laughs. ABC3’s most popular event is its annual Smackdown, involving all the channel personalities each January. Despite working year-round presenting for ABC3, Phyland admits to loving her job, especially when she meets the fans. “As cliché as it sounds, it’s so nice meeting your audience,” she says. Studio 3 airs mornings from 6am and afternoons from 5pm on ABC3. It’s a great shame the ratings are so low. Kids prefer to watch US cable shows on Nick, Disney, CN, rather than quality, locally produced shows.